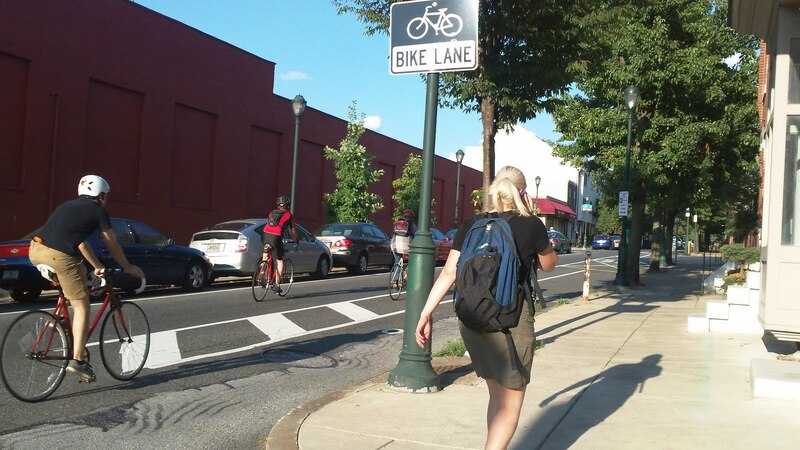 On Tuesday evening, the Washington West Civic Association and the Center City Residents Association both voted in favor of upgrading the Spruce and Pine bike lanes in Center City, Philadelphia. The meetings—which featured presentations by members of Philadelphia’s Office of Transportation and Infrastructure Systems—were conducted in order to get letters of support for Councilmen Squilla and Johnson, who need to introduce ordinances to make the upgrades a reality. The Washington West meeting was moderately attended (about 30 came) and civil in nature. Much of the discussion had to do with parking and loading. One issue of note is that over 300 parking meters will be decommissioned, presenting an opportunity to convert them into bike parking racks. The most notable changes coming to Spruce and Pine Streets is the switch of the bike lanes from the right to the left, and putting in intersection treatments. As I noted in an article for Metro Philadelphia, switching from the right to the left may give drivers more visibility (since cyclists will be on the same side as the driver) and create a narrower blind spot than on the right. The second benefit is that shifting the lane will reduce the likelihood of interactions between cyclists and motorists taking right-hand turns. Right hand “hooks” are the most prevalent type of bicycle crash in cities nationwide. Angle crashes, of cars turning right, into cyclists, are the most common type of bicycle crash on Spruce and Pine, making up 61 percent of total crashes, according to a Bicycle Coalition of Greater Philadelphia analysis. Additionally, the plan calls for remaking, and protecting, the intersections, where bicyclists and motorists currently mix — which may be the most important part of the current proposed changes. Shifting the bike lane to the left will reduce interactions with SEPTA’s Route 7 bus. Check out OTIS’ Powerpoint on the project here. And see the results from the previous meetings here. After about an hour of questions, the board members stepped out of the room for about 20 minutes to deliberate. They returned and told the audience that they would recommend to Councilman Squilla that the necessary ordinance (to move parking) be introduced and that further debate should be addressed at the Streets & Services Committee of City Council when the ordinance comes up for its first hearing. While the board conditionally supports oTIS’ plan, it wants to see how oTIS handles the block by block discussions about parking. CCRA voted in favor of the switches, 16-0. Washington West voted in favor in an executive session. Among the highlights, members of these boards specifically noted that added safety benefits are needed, including better maintenance of the bike lane, enforcing No Stopping zones during rush hour. These are positive developments. We will keep everyone updated as to when the hearings for these changes will take place.